My life is so tragic that I used to schedule two hours first thing every morning to cry my eyes out, but that got old after a while, so I decided to stop hanging around with poets. It was more fun to look back and laugh. So I suppose that makes me a humorist. One tragic thing about my youth was that my Mom didn’t like camping. My Dad did a foolish thing, which was to take her camping on their honeymoon. He thought he might open her eyes to the beauty of nature. It poured. Years later, when he was a little wiser, he took her to the Caribbean. She stepped on a poisonous sea-urchin. Come to think of it, maybe Nature didn’t like my mother. When my Dad took her out mackerel-jigging she caught a sea-gull. It squawked and flapped about her face at the end of a hand-line, and she indignantly concluded only fools found joy in mackerel fishing. Nor did she like anyone finding joy in her discomfiture, but Dad did a foolish thing, which was to laugh. Back in my days as a bachelor and bum I did a lot of camping, for a tent was cheaper than an apartment. In 1987 I camped from May 1 to October 23. This presented me with a bit of a dilemma, for if I didn’t write my Mom she’d worry, (and I usually couldn’t afford a phone call.) The letters I then produced were masterpieces in the fine art of censorship. Every day camping was a sunny day, and rain was never mentioned. After I surprised everyone by marrying and settling down, I got a surprise of my own, for it turned out my wife’s mother did like camping. I didn’t know that was legal for Moms to do, but she’s gone right ahead and done it. As a young mother of five with a hot home, too poor to afford a summer house, she had moved to a campground by a lake each summer, perhaps to escape the heat or perhaps to escape vacuuming the house. 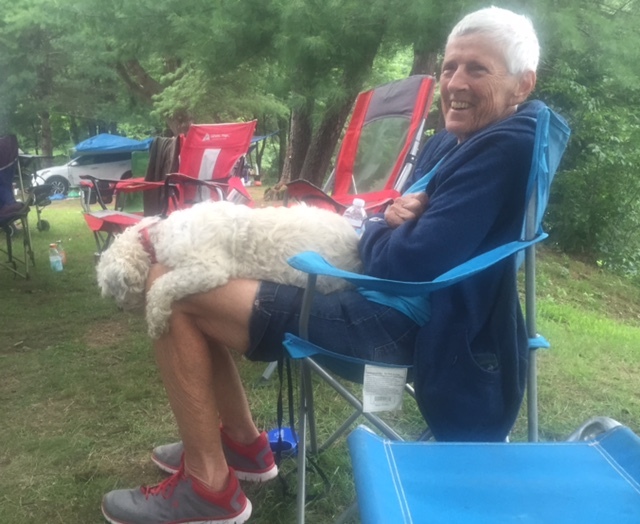 Her husband would commute to work from the campground, and the kids rode their bicycles about and fished and swam to their hearts content. They don’t seem to remember any rain. 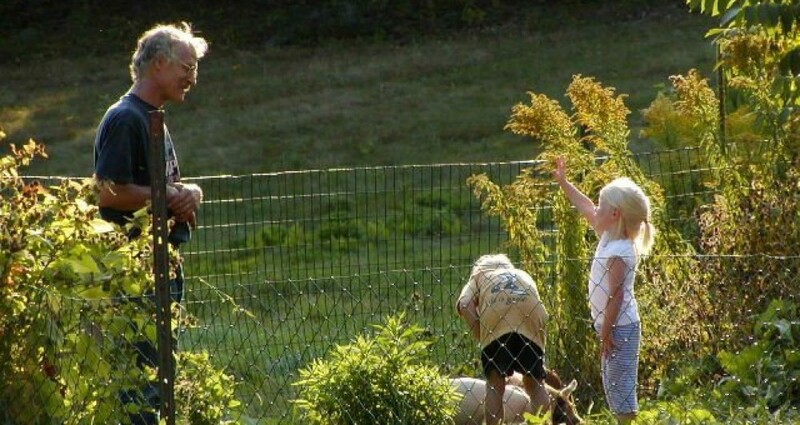 The mother didn’t know what she was starting. It became a yearly event. This year the lady, in her eighties, sat back and happily regarded her daughter and three sons, their four spouses, ten grandchildren, four grandchildren-in-laws, two step-grandchildren, two step-grandchildren-in-laws, six great-grandchildren, and two step-great-grand children, and likely thought about the ones who couldn’t make it this year. It rained, of course. It seems to rain every year, but we count on the rain, and one of the first things we do is stretch out tarps between trees. I am proud to state I was the one who started this great tradition in 1991, and as the years have passed it has become a sort of art, as we’ve learned by making all sorts of mistakes. A tarp can turn into a spinnaker in a strong wind, and snap ropes, and also a tarp also can turn into a massive udder if it catches rain and sags. Now we have learned all sorts of remedies, one of the best of which is to get old, so you can sit back and watch others clamber about in trees. Only once did I arise this year, as the wise old man, to show them the trick of tying a rope to a hammer and tossing it up over a branch, so you can skip the climbing, (which I didn’t learn until I was pushing fifty and getting tired of bringing an aluminum extension ladder camping, and saw a friend who was lazy demonstrate the hammer trick). This year no one had a hammer so they used a hatchet. It added risk to the enterprise. I’m not sure we could have done as well if the winds had been high. 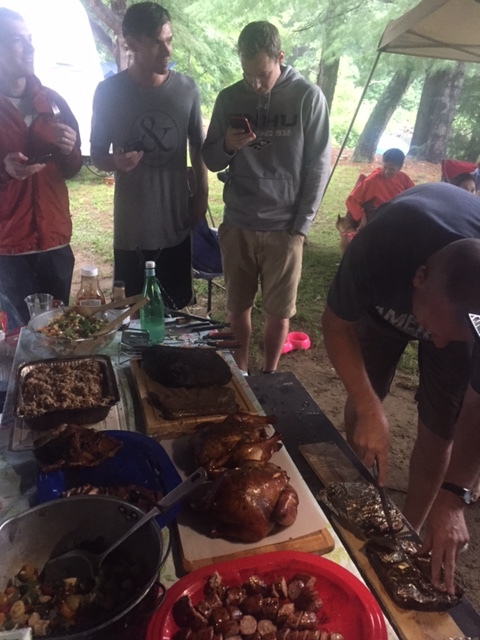 Around five years ago we gathered in the gusty deluge of a former tropical storm, and as I recall we put off the gorging until the next day, but this year the feast was prepared despite downpours. 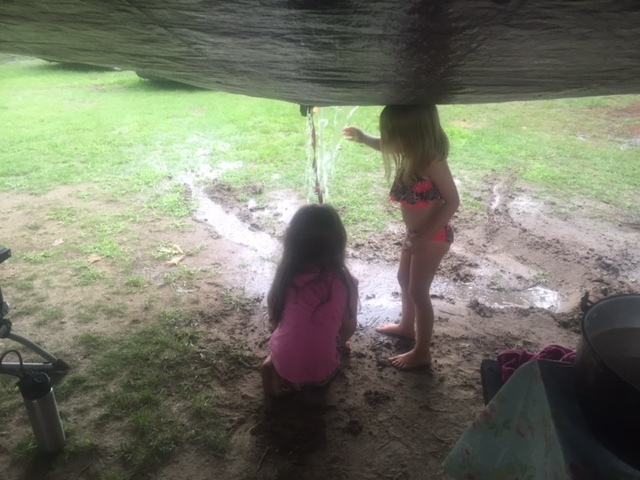 It was interesting to see the smaller girls incorporate the water coming off the tarp into their play. My wife strongly believes that, to acclimatize grandchildren to camping, you need to break them in early. 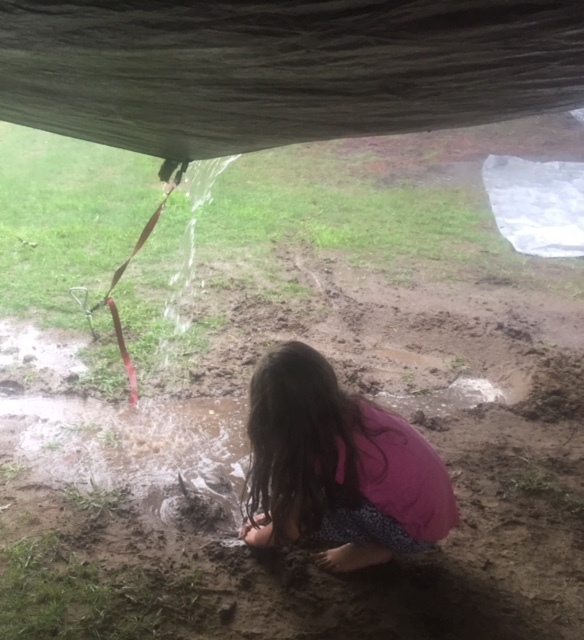 We’ve been camping in the rain so long, nearly thirty years now, that we’ve watched an entire generation go from being this small to being stronger and richer than we are. I like to just sit back and contemplate the passage of time, but did get up and take part in a game of whiffle-ball when the rain let up for a bit, and now rue my brief ambition. Within hours I was walking funny. But the former boys are now strapping young men who don’t stiffen up so quickly, and who itch for challenges, such as jumping into rivers from high places and being carried downstream. This river is the Ashoelot, a geologically interesting backwater that flows down a channel made by a glacial flood. Usually it is fairly shallow, but all the rain had its waters rising. When we first arrived my dog L.C. (short for “Lost Cause”), (Animal Rights Activists think I’m calling her “Elsie”), had a great time annoying herons and geese on the river, which was a little higher than usual. But the clear, tea-colored water had risen three feet and turned to coffee by the second day. By the third day it had risen three more feet and gone dark again, and had the spin-drift suds that sometimes indicate pollution, but can also be natural, in swampy rivers. 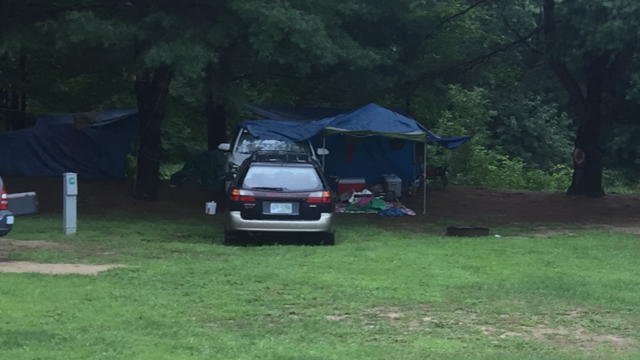 The campground owner said the water was as high as he’d ever seen it. Driftwood shifted, with its colonies of greenery and crimson blooms. Himph! No one asked me if I’d pose for a calendar. And I tell you, I’ve taken on all four of those fellows and whupped them with one hand behind my back……twenty years ago. As the evening came on I sat in the light of the campfire listening to the patter of the rain on the tarp overhead, and the deluge became a flood of memory. I listened to the murmurs of conversation, snatches of laughter, and strumming of a guitar and thought about what a fool I was thirty years ago, when I decided I had God’s plan for me all figured out. I was camping all alone in the New Mexico desert, and expected to be single all the days of my life. In fact I managed to convince myself that being alone was likely for the best. Spirituality is all about renouncing the things of the world, and it would be far easier to renounce everything if I didn’t have anything. Just as it is far easier to be a teetotaler if you have no booze, it would be easier to be celibate without a babe. My “bad karma” was actually “good karma”. Not so fast. (Though it did happen with astonishing speed.) In fact, when I told a spiritual friend I had married a mother-of-three I didn’t try to explain it, beyond saying, “I don’t know what happened.” Karma is like that. Just when you think you have things figured out you learn you’re just a chip on a mighty river. There are times when leaving all worldly possessions has a definite appeal. The Australian poet Francis Brabazon describes a man who came to Meher Baba and offered to lay all his worldly possessions at his feet, namely, a wife and six kids. However when Jesus said, “Leave all and follow me”, he didn’t mean just your “bad karma”. All means all. To be true follower you have to give up your “good karma”. Yikes. That is not so easy, when the kids who seemed like “bad karma” grow up and delight you by being “good karma” in a campfire’s wavering glow. It is no easy thing to truly give all to God. We are all addicts. But it helps when you reflect on how bankrupt you are without the gifts you have received from God. (I’m not sure where atheists think their talents and “luck” comes from.) It helps even more to believe God is love, and even “bad karma” holds compassion, though it may be a blessing very deeply disguised. As a cancer survivor I know even accursed cancer can be a blessing, for it makes every day a treasure. One lives praying the doctor doesn’t deliver the bad news, “it’s back”. It is as if you are looking around for the last time. Habits people have, which once annoyed you, become strangely endearing. It is oddly ambiguous that, when we think we have control of our lives, we are full of complaining, but when we lose control we experience an overwhelming gratitude. Perhaps that explains (to some) why “leave all and follow me” is not really loss, but gain.